Burdock is a vegetable with lots of dietary fiber. 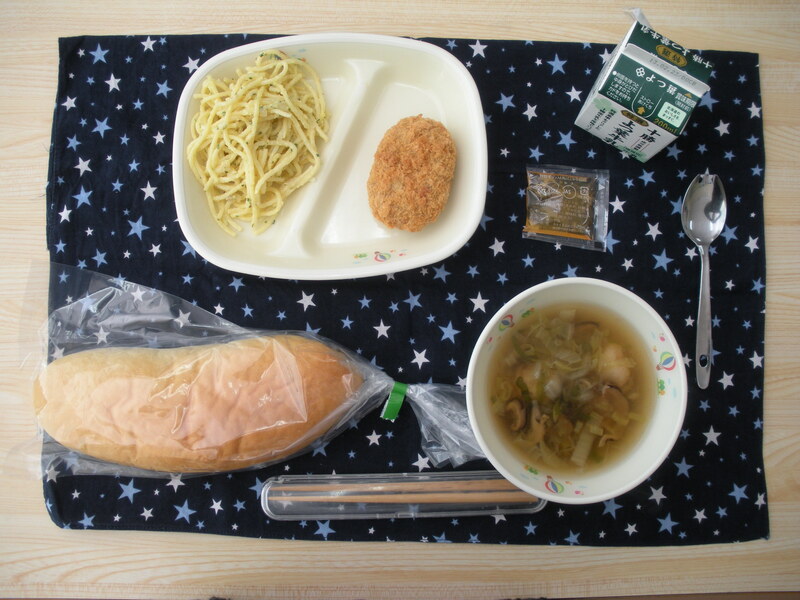 We can’t digest the dietary fiber in burdock and it passes through our body, making clean our stomach and intestines. Burdock is a master at cleaning our stomachs. Can I be honest with you? I am all squeamish about eating fish which still have their heads, tails, or even many bones. 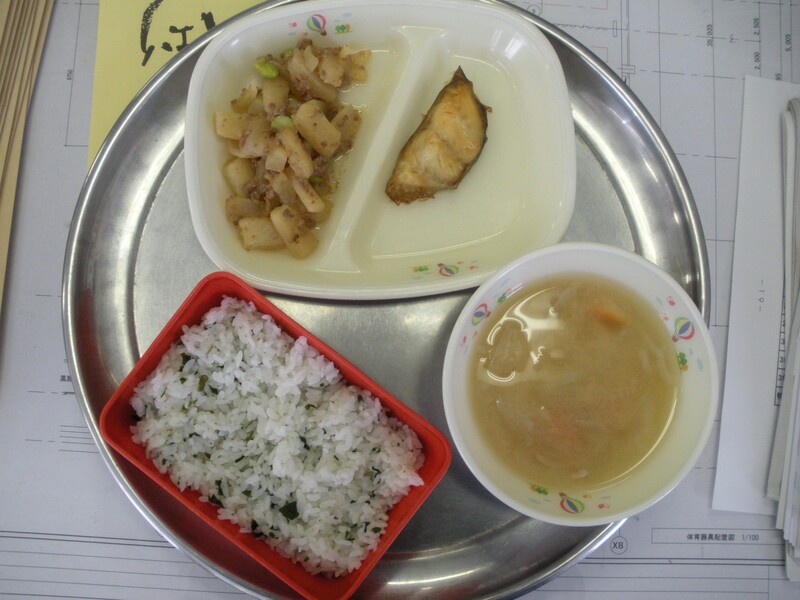 So the susuhamu isn’t in my picture because another teacher kindly ate my portion for me. It’s childish to be all “it looks weird, I won’t eat it”, but oh well, I’m foreigner so its okay right? 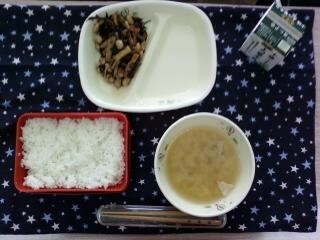 But I ate all of my delicious hijiki and soybean simmer! In my island home and in Japan too, milk is served with every school lunch and students are encouraged by teachers and posters to drink their milk, especially in elementary school. In junior high school, a lot of students no longer drink the milk, because they don’t like it or it makes them sick. However, I think due to the meat and dairy heavy diet in schools and often at home too in modern Japan, Japanese people are on a whole getting taller and taller. Is being tall a good thing? In modern fashion magazines and the opinion of most modern people (especially in the West), yes. But this is a really new opinion in Japan. It is an opinion that has been copied blindly from the West, I feel. In fact, I would like to argue that being tall is evolutionary disadvantages for an island country like Japan. On islands, resources are somewhat limited. Likewise, there are not many natural dangers that require a large body to fend off. So on an archipelago like Japan, being smaller in size–thus requiring less resources–is to a person’s advantage. This can be even been seen in some animal populations in Japan, such as the Honshu fox or Ryukyu deer. You might argue that being bigger has its advantages now that Japan must compete with the taller, larger Westerners. But when Europeans and Japanese men were compared at the start of the Meiji period, the Japanese were able to better run long distances, endure extreme conditions, and so on than the Europeans, and with less food and resources (cf. Hearn). So I think we should be careful to avoid blindly copying ideas when they might not necessarily be the best depending on the situation. Horenso Spinach is a winter seasonal vegetable. It’s sweetness increases in the cold of winter, and it develops lots of healthy vitamins. Today, we used it in the soup. Inside of this time’s scotch egg is not a chicken egg, but a quail’s egg. As scotch eggs are a type of dish from England, they are eaten cold. 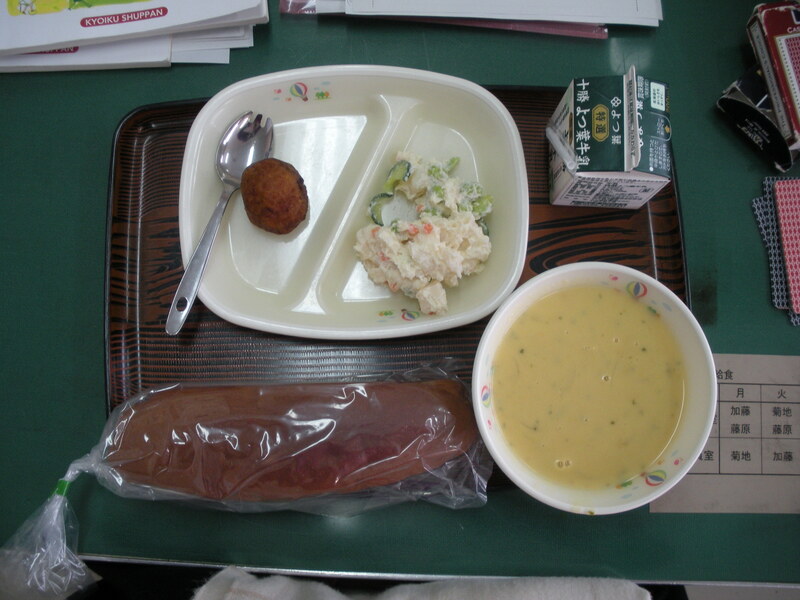 I felt the cocoa bread was not well suited for dipping into the corn soup, but separately they were good. Scotch egg sounds so delicious, but I feel like the egg is very much over cooked. I suppose this can’t be helped in school lunch, but I still think it is a shame. The kyuushoku dayori brings up a good point commenting on how scotch eggs are generally eaten cold. 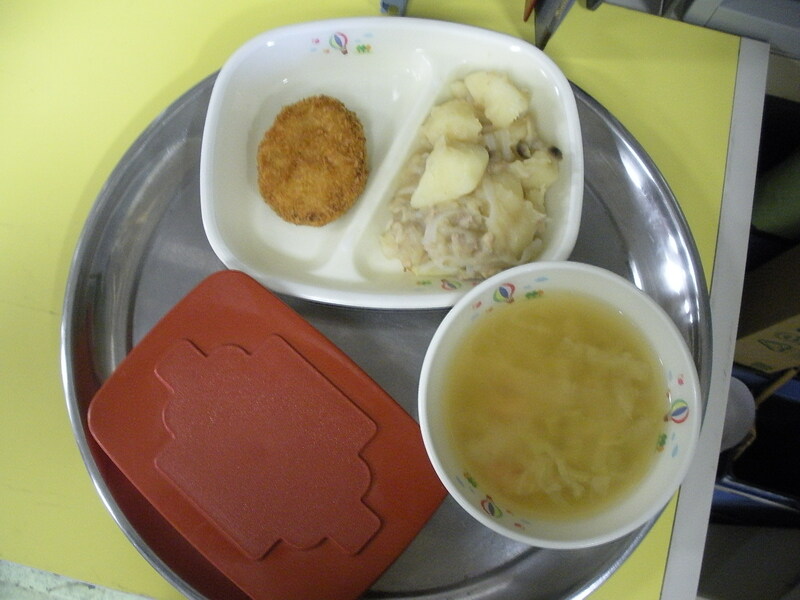 A complaint I have heard from other foreigners about school lunch is that it is served cold. 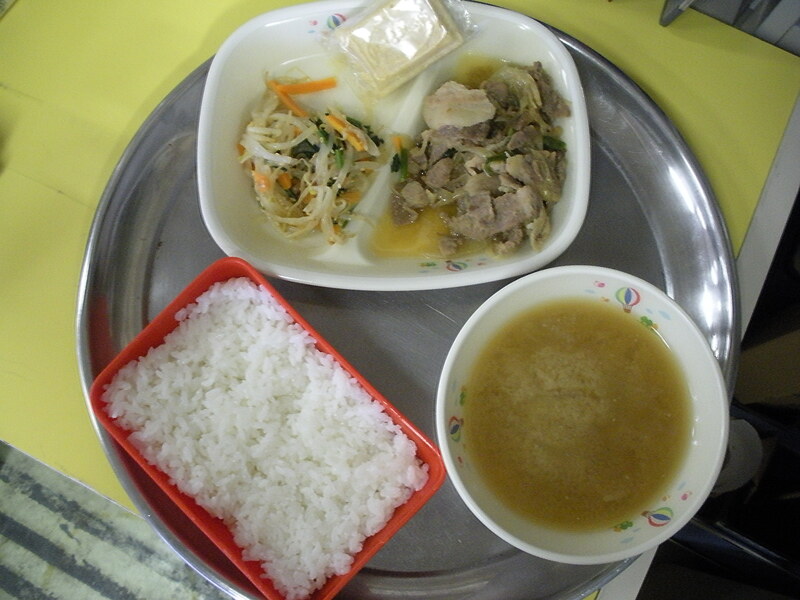 But Japanese meals, excepting of course the soup and rice, are generally supposed to be served cold (thus relaxing the necessity of a strict dinner time). While most Americans at least I think would find a cold scotch egg yucky, probably many Englishmen would probably find a hot one equally off putting. Of course, I had never had a scotch egg until I came to Japan, so I am not really that well versed in the matter, and should probably refrain from saying more. Speaking of preferences differing from country to country, enka is a style of Japanese music still quite popular in Japan, but not well liked by most foreigners. As for myself, while a lot of enka is too “pop”-like for me, lately I’ve been listening a CD called 敬天愛人 (Revere Heaven; Love Man) by the artist Ogata Daisaku. All of the songs are about different heroes of the Meiji Restoration and I’ve really taken a liking to it, so to speak. So here is one of the songs. It is called “Katsura Kogorou”, who was a young reformist who was known for his many daring escapes from the bakufu inu. What is “okaka” in today’s sanma okaka-ni (simmered saury)? Can you guess if I say there is a type of rice ball called okaka? The answer is katsuo-bushi (dried bonito). Maybe it started as a woman’s word? We handed back the test to the students today, which made me consider tests in Japan. Standardized testing is of course a fixture of most mandatory educational systems, and Japan is no different. But outside of standardized testing, which was probably introduced by the West, Japan has a lot of voluntary tests you can take. Two popular tests with my students are the Eiken, an English test, and the Kanken, a Japanese kanji test. These tests aren’t needed by the students, but a lot of students like to take them to challenge themselves. Testing in Japan is nice because they don’t try to test some ambiguous and ill-defined “real life ability”, but instead test an established set of knowledge which not only proves your familiarity with the subject but also the motivation of the student to study hard and put in effort. The other day, I took some practice tests for two other tests they have: the Chado Kentei (about Japanese tea ceremony) and the Jinja Kentei (about Shinto). It was pretty fun and I didn’t do that bad either. I would like to take those tests for real maybe next year. Why don’t you consider taking a test in subject you are interested in? 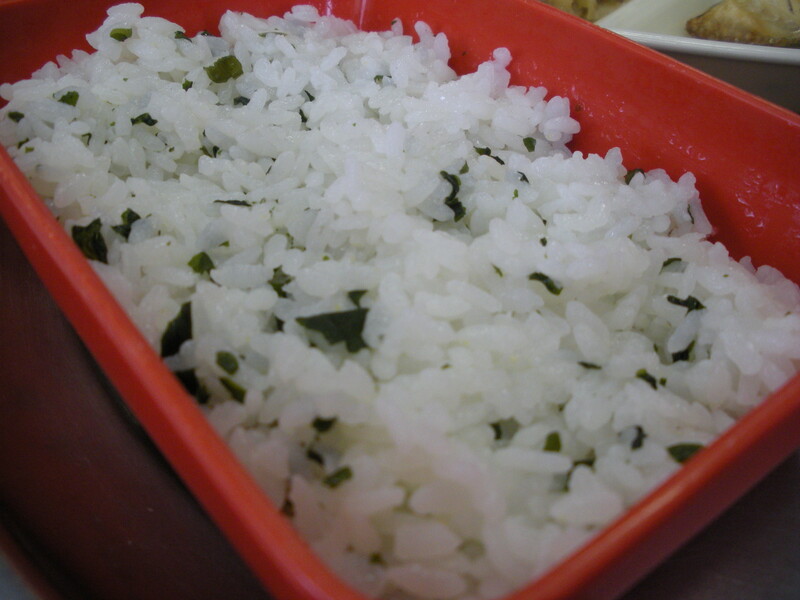 Konnyaku comes from the konnyaku taro, which is related to taro. It has lots of fiber, which prevents constipation and cleans out your intestines. I caught a cold today. Nikujaga (meat and potatoes) is a Japanese dish that everyone knows. Actually, it is said is started as an imitation of beef stew. 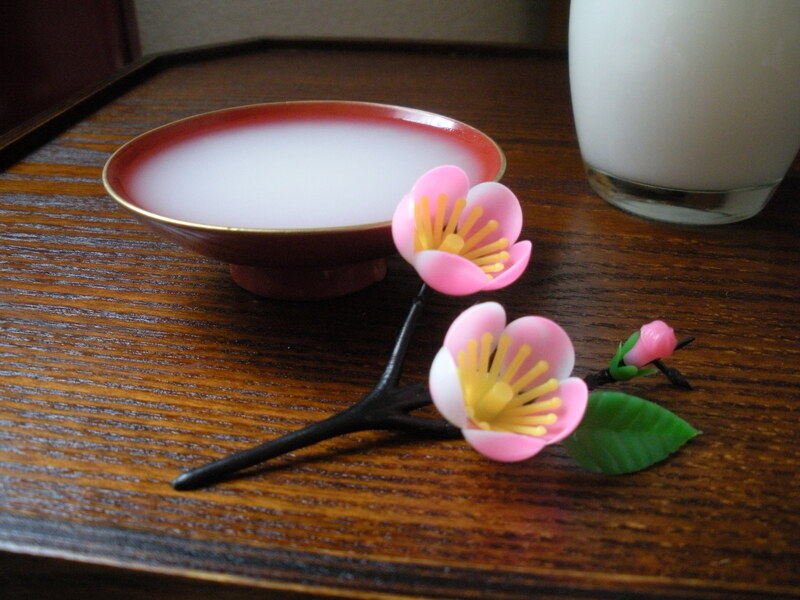 Unohana is literally the duetzia flower, but in this case it refers to a type of dish made with okara (soy bean lees). The last furusato kyuushoku! I generally say I don’t like Korean food, but today’s namul was really good. It was like lightly boiled veggies dressed in ground sesame. I hope they serve it again. Most my students seemed to eat it too. The tofu in today’s soup was a tasty treat too. Naupi, also called nappi, is like a monaka sweet, except instead of being filled with sweet anko, it’s filled with natto. Not enjoying the sticky texture of natto, I don’t like it so much. 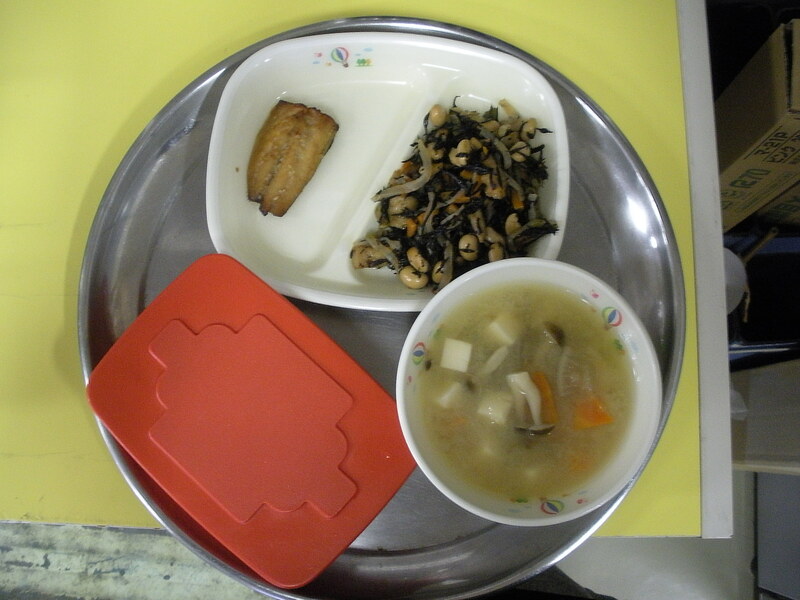 But naupi seems to be a very emblematic food of old Hokkaido. I feel like I should make more of an effort to develop a taste for it. I hate to say, but I think half the students in my class didn’t eat their naupi (although one boy ate like five of them, so that pretty awesome). 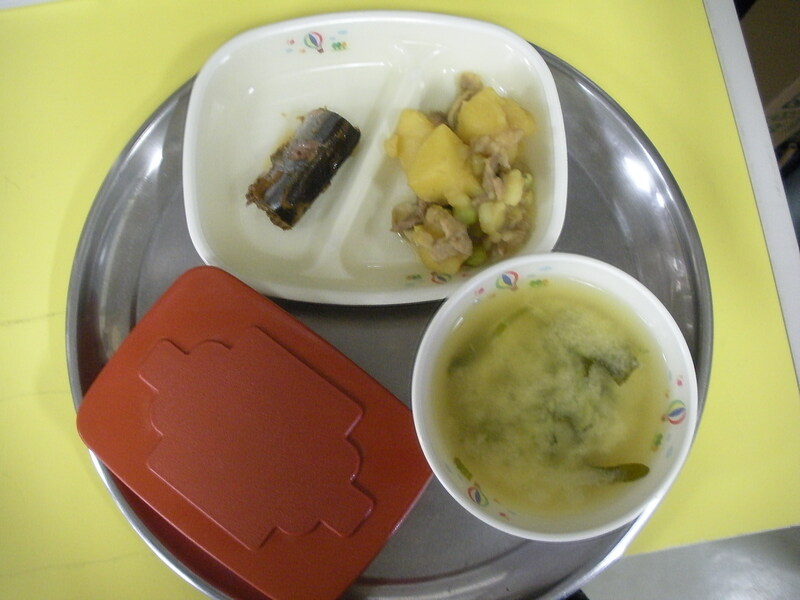 However, despite this waste, I still think it is good to serve in school lunch once or twice a year to remind student–or introduce them!–to their cultural heritage. 今日の日本語：冷気あいつのり候所、ますますご成熟慶賀奉り候 Did I choose the write kanji, I wonder….